Survivors: Sons- Walter Gibson, Denver Lee Gibson, Ken (Daledith) Gibson, Daughter-Loretta (Ellis) Slone; Grandchildren- Kenneth, Brittany, River, Sarah, Stephanie; Great-Grandchildren- Madison, Brooke; Brother- Sherman Jacobs; A Host of Family & Friends. 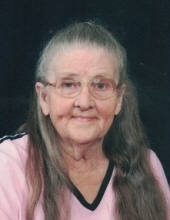 Deceased Relatives: Husband- Bernie “Billy J” Gibson; Grandchild- Tyler; Parents- Walter & Toni Short Jacobs; Brother- Charles Jacobs; Sister- Winnie Sue Collins. Time and Place of Services: 11AM, Saturday March 23, 2019 at the Nelson Frazier Funeral Home Chapel in Hindman, Kentucky. Visitation: 6PM-10PM, Thursday March 21, 2019 and 6PM-10PM Friday at the funeral home chapel with services each evening at 7PM. Burial: Gibson Cemetery -Mallie, Kentucky. "Email Address" would like to share the life celebration of Gertrude Jacobs Gibson. Click on the "link" to go to share a favorite memory or leave a condolence message for the family.